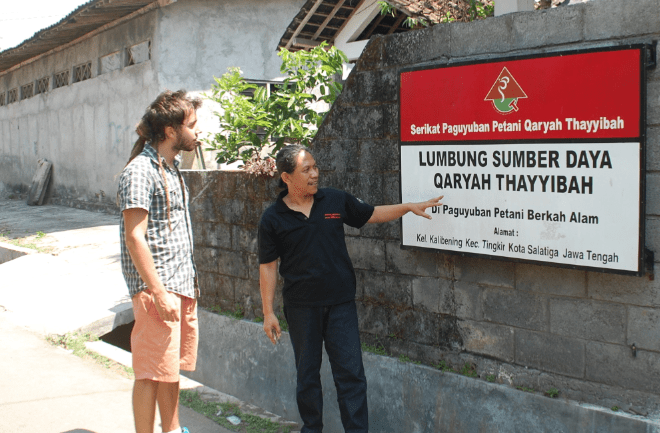 Javier Collado talking with Ahmad Bahruddin in Salatiga, Indonesia. Javier Collado Ruano: Dear readers, it is a big pleasure to me to introduce you Mr. Ahmad Bahruddin, an experienced leader in Indonesia, who is working with a rich alternative educational project namely Qaryah Thayyibah Learning Community (QTLC) in the region of Salatiga, Indonesia. I have had the opportunity to visit it along my friend Mulyono Sardjono and his family, and I have not doubts that such experience will encourage many people around the world to following in his steps. Dear Bahruddin, thank you very much for sharing your time and experiences with all us. 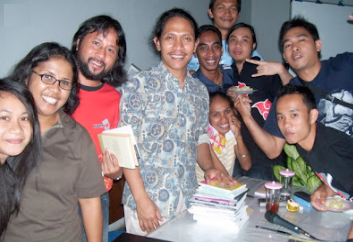 Ahmad Bahruddin: Hi Javier, thank you very much for your to visit our school in Indonesia. The pleasure is me. JCR: What is the origin of the experience and when was it born? AB: The education system in Indonesia does not give the students to freedom of thought and tend to be “imprisoned” by the curriculum designed by the central government. The education system does not respect the local intellectual property that a child who is very smart locally could be considered foolish when assessed from the national curriculum. It was our concern when establishing alternative education which we named Qaryah Thayyibah Learning Community in 2003 by providing a broad opportunity for the learners to explore their talents and capacities. JCR: What kind of challenges did you find to develop the project during all those years? AB: The challenge has always came from people who have a regular and established mindset. They question “what kind of school is it”? Why does the school have no schedule? and Why were subjects were given their own wishes?, etc.. They also questioned whether they later received a diploma, and whether it can be used to apply for jobs. So the challenge is how to change the “mind-set” of society that learning does not have to be in a formal school building and using a uniformed curriculum. JCR: How many students are in the school and what are their ages? AB: The numbers of the alternative school (QTLC) fluctuate from year to year, and currently there are 41 students with ages between 12-18 years. It started in 2003. But besides the alternative school, we also organize also Qaryah Thayyibah Farmer Groups Union, QT-FGU, founded in 1999. The QT-FGU is used for the adult groups, especially farmers, to learn about the agriculture and life. Today this union consists of 55 groups, and soon the other 15 groups will join. The members of each group vary from 20 to 50 farmers. 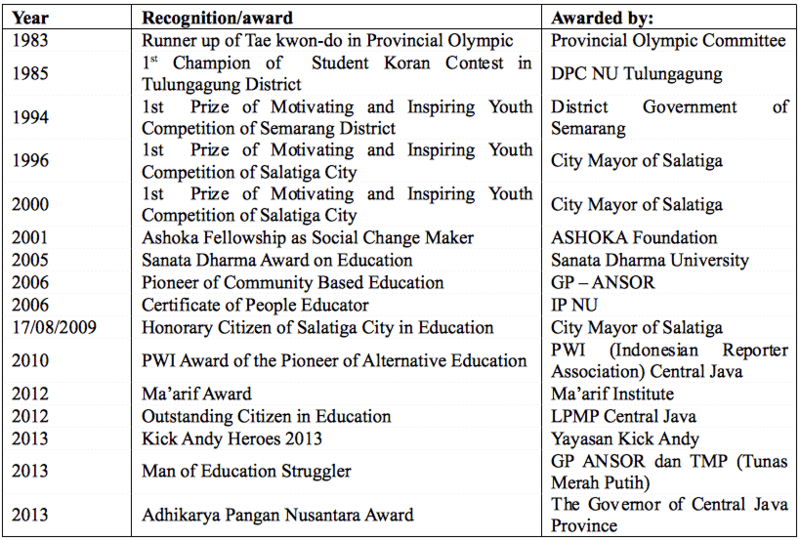 They are from several districts in Central Java Province. I can say if from the problem of education lies within the farmers family, we set up the alternative school of Qaryah Thayyibah. JCR: What are the differences with the national curricula? AB: Very different, because of the national curriculum and curriculum in Qaryah Thayyibah Learning Community (QTLC) are designed from the opposite thought. National curriculum places students as objects of teaching, while at QTLC positioned students as subjects, people who studied and have active consciousness. The National curriculum as a formal reference for the schools retain the students as objects to be “tamed” and converted into an empty container ready to be filled with whatever is taught. Curriculum that has been used by conventional schools place the teachers position as the only source of knowledge for the students. On the other hand, QTLC provides full space for students to read, to comprehend, and capture life in full for later criticized. Student or learner is the subject of active thinking, and should be protected in order for these critical thoughts to be developed into something productive. JCR: What methodology are you using to change the families’ vision? AB: Actually there is no specific method used. The key-point to change the vision is through communication and a personal approach. Besides, learning outcomes achieved by students can also be a medium that is changing the families’ way of thinking. JCR: What is the participation of the community with the activities of the school? How often there are assemblies and how do you promote a democratic participation? AB: The relationship between the school (QTLC) and the community is good. The community provides support in many ways, such as providing homes, land, day-to-day activities as a medium of learning. And specifically the parents of the students also helped school facilities in accordance with their capabilities. No special meeting is held with the community to promote democratic values, but in the farmer group meetings, the values of a democratic, open mind, respect for others, and just become the mainstream in the daily activities. 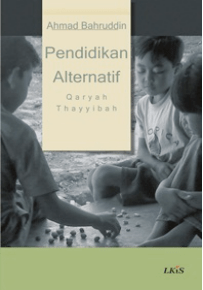 For information, beside the QTLC alternative education for children, there is Qaryah Thayyibah Farmer Groups Union, QT-FGU. JCR: Do you have any political support? What are the links with the local, regional, and national government? What authorities have been visiting the center? AB: Until now there is no significant support from the government. There is a small amount of money for transport allowance for the facilitator given by the government, but the amount is not much. However, for the current context, we looked forward to the new government which will be inaugurated in October 2014. We have a political contract with the party winning the election to encourage community-based education. Some time ago we were also visited by Mr. Joko Widodo – the elected president in 2014 – and he expressed to support the community-based education process. We also have been visited by many educational institutions from many countries (other Asian countries, Arabic Countries, European countries, and USA), and also you from Brazil. You know, Paulo Freire is my favorite. JCR: What will happen after school? Will the students continue with university studies? AB: After completion of their school, they continue their live as members of the community. They use their knowledge and skills to improve their quality of life, raise their families and help communities. Some students also continue to study at the college or university. JCR: What is the function of teachers in this alternative educational paradigm? AB: Ideal learning process is a process in which there are tradeoffs between teachers and students, the process that promote dialogue and discussion processes, not a monologue teaching system. In Qaryah Thayyibah, the task of the teachers is not to teach, but teachers are friends for the students who are looking at and studying the world, as well as the motivator who encourage students to be more critical and creative. Teachers are more as a facilitator, and students are given the freedom to seek knowledge from a variety of learning resources. JCR: And what do you think it is the role of media and Internet to raise awareness between citizens? AB: The internet is an amazing technology for this time. With the internet people around the world can be linked in real time in an easy way. Today, many people can not live without internet. However, the internet can be negative and dangerous when it is used with consumptive mentality. The existence of Qaryah Thayyibah has become “relatively well-known” by the public, among other things are because of the internet. Promoting ideas directly, via printed materials, and electronic media – especially the internet – is very helpful in promoting the idea and practice of alternative education – which is in fact produces good outcomes for the community and nation in a broader term. JCR: Where have you disseminated your experiences? Have you published any video or book? AB: Yes, we produce videos, printed materials, books and other media. But mostly they are designed and made by the students. The school management and teachers are only the guide for them, and sometimes they become the objects of the video. It is amazing and unbelievable, one of our student published 25 books at such young age. She has finished her studies in QTLC now, and continues her life as a writer. She also become a volunteer in our school. A lot of book are published by famous publisher in our country. JCR: By the other hand, how do you work with the religion issue? What is the percent of each religion among your students? AB: In my opinion, religion is a tool to fight injustice, therefore understanding religion should be done in critical and logical ways. The society here is a religious community, and religious issues, if not managed properly, can be used to mobilize people for a particular purpose. QTLC promotes the values, of pluralism, just because the majority of people here are Muslims. All students of QTLC are Muslim. Nonetheless, Thayyibah Qaryah actually opened to students of other faiths. We also collaborate with other religious organizations, particularly Christian organizations. I am personally often involved in inter-faith discussions with prominent figures from other religions in our country. JCR: What kind of agricultural activities do you practice? Are you manufacturing food? AB: We do simple farming, as practiced by the community in rural neighborhoods. We, together with students are cultivating horticulture and cash crops. For example, we are planting chillies, vegetables, cassava, etc. and this is done with the principle of organic farming. We also cultivate mushrooms. We do not produce processed foods, but in the future it can certainly be an opportunity worth exploring. Agricultural products are sold to the community members by students around the school, or even to traditional markets nearby. Our farming practices are still functioned as ‘laboratories’, which have not been done as a productive business. JCR: What other youth policies do you make to support education for sustainable development? AB: We see the youth as the future shape of our nation, so that is why we want them to be wise. In our little activity we learn together how to live harmoniously with people around us and with the environment we live in. Life activities should not deteriorating the environment. JCR: What is the role of imagination and creativity in this alternative educational vision? How do you promote the literature, music, sports, and arts? AB: Imagination and creativity in this alternative school are very much appreciated. We can say in this case that we are different from the conventional schools. For example, once a week (on Monday morning) every student has to write down their own “idea” of the week, then it´s shared and discussed with other students and teachers/facilitators. Why do they have such idea, and how to realize it, etc. Then in that week each student will realize their idea with their creativity, then report about it in the next week. So far we promote our culture, like traditional songs, traditional music, folklore in form of videos and also printed materials. JCR: Have you received any award or recognition for this kind of alternative education? JCR: What are your future goals for the next years? AB: In the future we want to see all of the 73,000 villages in Indonesia have their own alternative school or alternative education forum, beside the formal school, that is run locally. This is accomplished, which is in turn, will improve the quality of all citizens. We hope the new ruling government would like to help and promote this kind of education after seeing that what we have done has been fruitful. Today at least 25 other villages have visited us, and they ‘replicated’ the idea of this school and implemented based on their local context. JCR: Where could our readers find more information about your alternative educational experiences? Do you have an official website? AB: You may visit www.kbqt.org for the alternative school and the blog of www.sppqt.wordpress.com for the farmer group union. But so sorry, both are still in Indonesian Language. You may search via google with keyword: “qaryah thayyibah salatiga”, where you will see many links that is written by others about us. JCR: Just to finish, would you like to send any special message to all our readers in the celebration of the International Day of Peace? AB: Thank you very much to you Javier for giving us the opportunity to share our work between thousand of readers in Global Education Magazine. We hope to see you agains soon! education into the doorstep of the learners. Students learn in their own pace. handling most of the major courses…….